The subject of God’s glory has been on my mind for over a year. Christmas Eve I spoke about the angels that appeared to the shepherds and said “Glory to God in the highest.” Why? First, it was because this was a seminal moment in divine history. The long awaited Messiah was born and the Shepherds would be first to see Him who was prophesied in the Old Testament (cf. Gen. 3:15; Isa. 7:14; 9:6; Mic. 5:2; etc.). These angels knew about that since they dwelt in heaven in the presence of God. They also appear earlier in the birth narrative confirming this. The word “glory” in this context means more than visual light. Here it referred to all that God is; it is the sum of all God’s attributes. That is mind bending to say the least. The “heavens declare the glory of God” as does all creation with man being the crown of it because we are made in God’s image (Psa. 19:1). But now in the incarnation God is “with us” in person. Secondly, the angels said this because Christ came to die for our sin. Romans 1:2-23 tells us man had exchanged the glory of God for corrupt things. But Christ came to pay the price for our disobedience (sin) so that all who repent and trust Christ may be saved from eternity in hell. The angels were pretty excited about the fact this process was started. But is goes farther than just salvation. They said “glory to God in the highest” to acknowledge God was in the “highest” heaven and to be worshiped because He is as glorious as He possibly could be. Men or angels can’t add to His glory but we can reflect it when we do His will. How are you doing? The Protestant Reformation emphasized getting back to God’s glory in our worship. The final point of Reformation was that “glory to God alone.” God’s glory is the “highest” thing. It is the meaning of everything. It is even above salvation. All that God made and all that happens is to God’s glory. Our culture is moving away from glorifying God and toward self-glory. Advertisements say, “it’s all about you.” This is an unhealthy self-focus and a narcissistic mentality. As Christians we need to refocus on God getting the glory and not us. In the New Year work put your selfish sin nature aside, stop trying to posture yourself to get glor and instead focus on giving God the glory. You can watch the Christmas Eve service music and message on the glory of God. 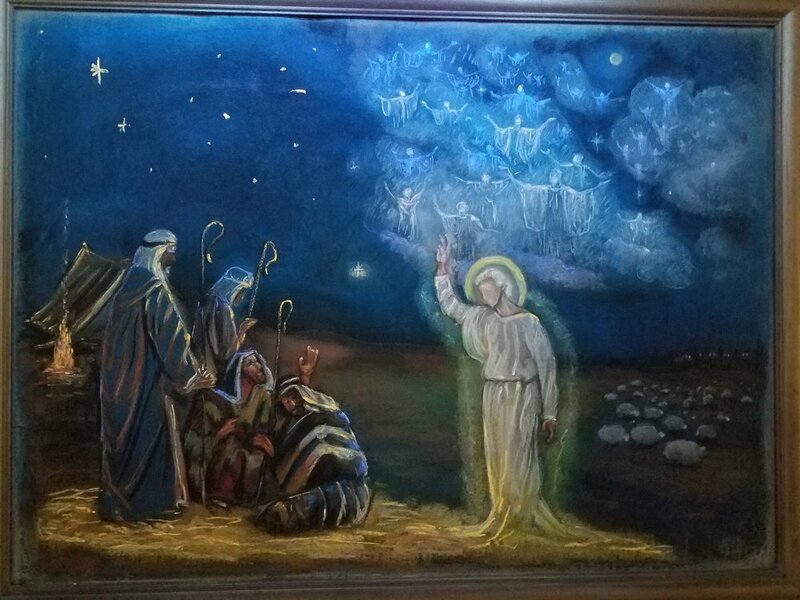 Here is the chalk drawing Adria Hanson did picturing the angels appearing to the shepherds. I appreciate her hard work in illustrating the scene in Luke 2:14. Glory to God in the highest. Hear the song that recalls this glorious event. Be aware of the following. Pete John’s memorial is scheduled for Sat. Dec. 29th at 3 PM at DBC. Sun. 12/30 there is no Sunday School due to holiday break. But, at 9:30 we will have a coffee fellowship time before worship service. Come and enjoy. Sun. 12/30 at 10:30 I will be speaking on Mark 3:20-35 and the question of the unpardonable sin as we are back in the book of Mark, the newspaper version of the Gospel.